Richie Whitt's DFW Sportatorium: Rangers' Reaction to Massive Slump: Trade Joe Nathan? Rangers' Reaction to Massive Slump: Trade Joe Nathan? The Rangers are mired in a massive, season-staining offensive drought. They're scoring less than Johnny Manziel at a UT frat party. It's bad. Real bad. And it's caused the Rangers to get mad, call meetings and ... consider trading their best player. As the Rangers return home tonight to face the Anaheim Angels - with a .220-hitting Josh Hamilton and without injured Albert Pujols - they'll drag with them one of their worst slumps in franchise history. Their offense has dried up worse than Betty White's uterus. The listless bats bottomed-out in Cleveland over the weekend. Back-to-back shutouts. No runs in 21 innings. Only eight hits in their last 68 at-bats. 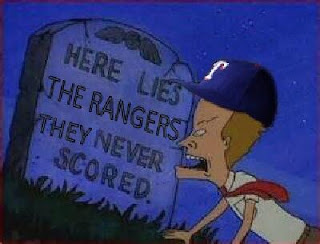 They're 2-8 since the All-Star break, punctuated by Mitch Moreland's 2-for-36 funk. Add it all up and the Rangers are suddenly as close to third place as they are to first, trailing the Oakland A's by six games. After the game manager Ron Washington had seen enough of nothing, calling a closed-door team meeting for almost an hour. "Sleep-walking," he said of his team. Last time this happened, it worked. A similar meeting on June 16 resulted in Texas winning nine of 11. But this time, more drastic measures may be needed. Bringing in Matt Garza is one thing, but without any offense the Rangers won't sniff the post-season, much less catch the A's. As the trade deadline inches within three days, one of the moves the Rangers are reportedly pondering is to trade closer Joe Nathan. If you believe Joakim Soria can close or if you believe Neftali Feliz will be effective when he returns in mid-August then it makes sense to trade your 38-year-old arm for a bat that will serve as paddles resurrecting the offense's failing heart. On the surface trading Nathan sounds kooky, but not nearly as unfathomable as reliever Tanner Scheppers' weekend in Cleveland. While he said he was "sucker punched," witnesses tell a tale of him simply "losing a bar fight." Whether it's meetings, or changes of scenery, or bar fights, or trading players or simply facing the best offensive player in franchise history, the Rangers need to snap out of it in July or else they will prematurely ruin September. fact is they are were not going to pick up his option next year so if and only IF you can get a very good bat under contract for next year... you do it in a heartbeat at this point. Nathan has been good closing games but he hasn't exactly been lights out doing it. Soria can step in for the remainder of the year. If they are not going to score runs.. then it doesn't matter who the closer is. They NEED offense.... the NEED a bat. "Their offense has dried up worse than Betty White's uterus." Proud of that one? Dont force it, let the game come to you a little bit. It's ok, Babe Ruth stuck out plenty. Keep plugging away, im sure this week will end with more hits than whiffs like that one. Agreed. Almost everyone loves Betty, mainly because she's a funny old broad. Trade him if the return is good. This thing looks to be just about done. I wonder if there is any bad juju in the room over Nelson Cruz? Does Sybil know that you have direct knowledge about Betty's dried up hey nanner nanner? The Rangers pen is definitely a strength this year, so it makes sense to see what they could get for Nathan. Soria, Scheppers, or Cotts could all fill-in at closer if Nathan Leaves. I think it's also possible the Rangers are targeting another starting pitcher. The Tigers have been heavily rumored to be interested in relief help and may not be done even after dealing today for Houston's closer. I think the Rangers could get Rick Porcello from them, a groundball pitcher they were linked to before the season who would greatly benefit from a change from Detroit's dreadful infield defense to Texas.